I submitted the following document with my campaign finance disclosures on September 6, 2011, but the city would not publish it. Sierra Club ask’s the Candidates. 1. Please describe your background and why you are qualified to serve as Ogden’s next mayor. I don’t already work for the city, county, or city council and I will not operate with the same status quo mind set. I am fair but principled and lead by example. With pride I served our country as a United States Marine and received multiple meritorious promotions for exceptional service. I have experience in building businesses with strong foundations that provide stability for the livelihood of others. I currently serve my community as the President of the Historic 25th Street Business Association and listen to the members of this association by making the right, but hard decisions, to the benefit of all. My real world experience, combined with strong ethic and integrity, will move Ogden forward for all 83,000 citizens. 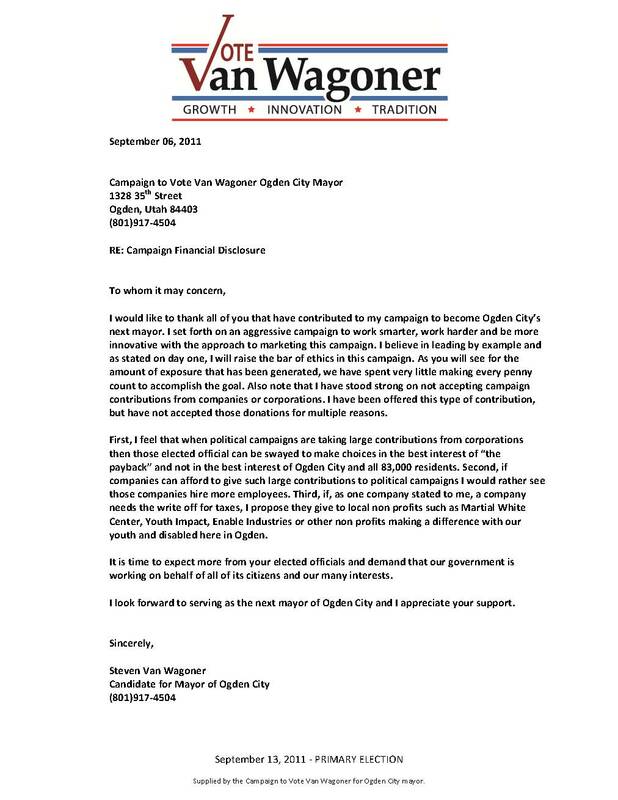 I will work for all of our interests in Ogden, and will not be a “single area of interest” mayor. I will work on your behalf, by listening and planning with your city council, to insure cautious budgeting, and expeditious implementation of plans for the benefit of you and your city. 2. In brief, why do you want to be Ogden’s next mayor? Our government should be working for the people. I look forward to building on the many successes of Ogden. Our area is unique with opportunity for sustainable growth in the many areas of interest in our community. We have many underutilized assets such as airports, railway, empty buildings and parks that cost us money. Working for the citizens, we must limit the government intervention in the private sector where government has no right taking risk at the expense of the tax payer. I have a branding concept called Made in Ogden that will not cost tax payers money but brand Ogden for generations to come. The goal is to support and bring product development back to our area and with pride, a seal will be stamped on product developed and distributed from here in Ogden. We have many businesses already here producing products, and we will champion those while in the process of attracting new businesses such as aerospace, technology, medical, as well as the core business of the outdoor recreations business. The Made in Ogden concept will build off of the past 10 years of attracting outdoor recreation headquarters to Ogden and will start the next step of bringing their core business to Ogden. It is important to have the outdoor recreations headquarters in Ogden but now we need to further develop those efforts toward the next step. Ogden needs the employment that comes along with their core business of product development, sales, distribution and service. Ogden is positioned with underutilized assets for distribution such as the above mentioned airport and railways, in addition to empty buildings, to support this type of growth. Our time to continue to shine is now. We are uniquely positioned for growth and by having leadership with consistent and sound government policy provides an atmosphere that existing local businesses can expand and new business can thrive. Working together we can simultaneously bring all level of jobs back to our city and brand Ogden as the place that does it better. I will insure that our low cost of living is maintained by limiting out of control government spending while the growth in our community is occurring. 3. If you were to propose changes in Ogden’s zoning ordinances to improve the quality of life and business in Ogden, what changes would you propose (if any), and why? Zoning ordinance changes are definitely something my administration will need to take a look at to be more consistent and citizen friendly. We have books of ordinances and regulations that may no longer be applicable to the current needs of the community. Working with staff and council I will look forward to make sure we thin out bureaucracy that costs money to maintain and adds frustration to so many citizens and businesses. Ordinances need to be looked at to make sure that their intended purpose is working or if there is a need for improvement. The way to identify deficiencies with minimal cost is by listening to the constituents of Ogden and by taking action as needed. We need to think about a pro conservation approach to make sure we are not limiting owners from utilizing their property in the most sustainable way. Because of such complex times, I would look at ways to insure basic rights to self reliance, such as the chicken ordinance. I also know that we need to look at some of the time restrictions on parking that encumber commerce around our city and irritate customers. Signs ordinances have many issues with room for improvement to better serve our businesses and we could better identify sizes of real estate banner signs. I think everyone will agree, and if so I would champion, that we need to limit the number of political campaign signs which would include a permit with regulations to follow. Signs can be a useful tool but they also pollute the community if not done with balance. 4. Ogden City, UTA, and other stakeholders have recently studied alternatives for a major transit investment in Ogden, to connect downtown with the WSU area. Do you support this proposal and if so, what are your views on the various alternatives being considered? We need a comprehensive transportation plan focusing on Ogden City as the county seat but connecting the region as a whole. I would build from the discussions and focus more on connecting all areas of interest in the community and sharing information. Over the past 10 years we have talked about gondolas, street cars, trolleys and bus routes to better serve the communities growing transportation requirements. These conversations have often been guided by single areas of interest and have not taken into account all of Ogden and the growth of greater Weber County. As a community we need to discuss how we connect all current economic business centers and plan for those that need to be built. While connecting main points of interest, such as the airport, business centers, universities, tech colleges, hospitals, and schools we build in progression of importance. With a comprehensive transportation plan geared toward transit oriented development, we also need to insure the plan services concentrated living neighborhoods, which could spur quicker revitalization of neighborhoods. 5. Through the Weber Area Council of Governments and the Wasatch Front Regional Council, Ogden’s mayor can influence transportation investments throughout the county and the Wasatch Front. What changes, if any, would you propose to the current regional transportation plans and priorities? Immediately end conversations about expanding Harrison or 36th St. Build a vision with the Council to invest in a sustainable future, building toward a comprehensive transportation plan that would include many options of public transit with expansion of identified bicycle, skateboard, horse and pedestrian corridors. Discuss a long term plan, then have each city decide what is best to service their community. Together set a deadline for plan collaboration whereas everyone discusses the growth trends along the greater Wasatch Front and Weber County. We listen to one another and compromise to make a plan that will benefit all of Northern Utah residents and guests. Our population is growing, our roads are becoming more congested, our air quality may decrease, and we need to work together to come up with a comprehensive plan that is forward thinking, and benefits all while distributing the cost appropriately. 6. As mayor, would you encourage or discourage further development of private and/or public land in Ogden’s foothills? Please explain. We must uphold the principals of private property rights and make sure all public land open space is protected for future generations to enjoy. 7. Would you encourage or discourage the development of a resort in Malan’s Basin, or a tram or gondola on the west side of Mt. Ogden? Please explain. I am on record in 2007 supporting the concept of the Gondola but never saw a plan to make a full decision. If the plan included taking public lands, I would not support it. If the plan included any liability to the tax payer of Ogden City, I would not support it. I would consult the council and the citizens for input with any decision that may impact the community and work with city council to make sound decisions. 8. Do you favor designating a portion of the National Forest lands above Ogden as federally protected wilderness? Why or why not? No, I think the best stewards of local lands are the local people. Working with organizations I think we can adequately protect our local lands for future generations to enjoy and I would be very hesitant of encouraging further federal regulation of the National Forest. Further I have met with Forest Service and I was told the designation may take an act of congress which could take over ten years and may impose restrictions limiting dogs, bicycles or other uses. 9. A major portion of Ogden City government is devoted to water, sewer, waste, and recycling services. What changes to utility rates and services, if any, would you propose to encourage more sustainable use of resources? Utilities are one of the largest expenses to our households in Ogden. We need to get away from being so reliant and in the process losing our sovereignty. Our city council adopted measures to increase our water and sewer with an approximate combined revenue increase of $6,000,000 dollars last year. We are hurting our seniors and others with fixed incomes because of the current and complicated fee structure. They simply can’t afford central services such as water. This is not right. Council can’t wait until the next mayor to fix the problem and needs to make immediate reductions now. The city council has elected to use funds that were designated for the infrastructure to be used on other projects and as a consequence you’re paying for it. As the city government we will work toward leading by example and reducing use of resources. As stated in question 3, we need to look at ordinances with a pro conservation approach to be smart about how the city grows forward. 10. What other environmental issues would you address if elected? A cost effective approach to limiting water waste at our 43 parks where the sprinklers run during rain storms. Potential employment stimulator, slowly converting utilities demands on city buildings to a balance of the other sustainable alternatives. Innovating away from wasteful manufacturing and becoming a more consciousness community educating all businesses and homes about decreasing their impact over time. We need to encourage that buildings are built with the most efficient standards and that bi-product such as emissions are controlled with guidelines to protect our children and our environment. We need to teach alternatives and encourage innovation and creativity within our schools to further environmental issues. Lastly, the dog food plant needs to improve the air quality that is omitted at times! Yes, I value the contributions to Ogden City by the Ogden Sierra Club and would accept the endorsement.